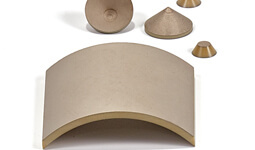 For superior performance in your ultrasonic devices, select EBL PZT piezoceramics. 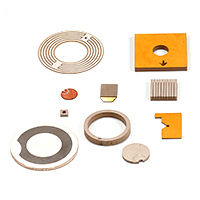 EBL offers an extensive range of both "hard" and "soft" Piezoelectric Components. 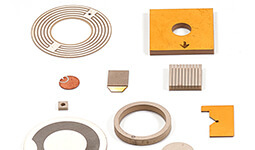 Hard materials exhibit low dielectric losses, high mechanical Q, and low dielectric constants. 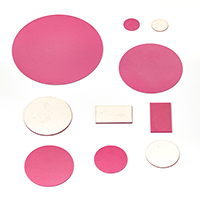 These materials are recommended for ultrasonic therapy assemblies, cleaners, sonar projectors, and related applications in which the piezoceramic is exposed to high drive fields and/or mechanical stress. Soft materials provide high coupling coefficients and low mechanical Q for micropositioners, NDT and medical imaging transducers, hydrophones, and similar high sensitivity devices. 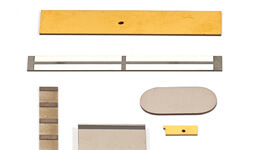 Additionally, we will fabricate from any manufacturer's piezoceramic that you specify. 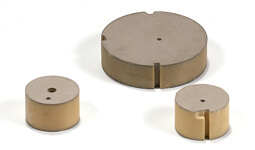 EBL's Piezoelectric Components are available with fired silver, electroless nickel, electroless copper, and sputtered gold/nickel. 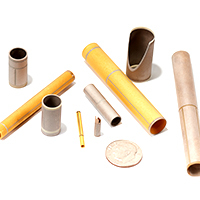 Fired electrodes are applied to the surface of the piezoceramic by screen-printing or airburshing, and then fused onto the ceramic at high temperature. 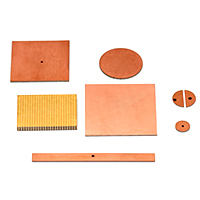 Electroless electrodes are applied by an aqueous immersion process developed by EBL.